A few weeks back, I sat in the front seat of a new Infiniti EX35 with the head of product safety at Nissan North America. The EX35 is a souped up "personal" SUV packed with technological features, including the first lane departure correction system and a video parking assistant. There are lane departure warning systems already on the market that beep you or vibrate the steering wheel when you drift out of your lane, but Infiniti's is the first that will actually do something about it. A dash mounted camera watches the lines on the road and when you go off course, it warns you, and then if you fail to take corrective steps, the system applies the brakes on individual wheels to pull you back in line. My favorite aspect of the system: It might finally get drivers into the habit of signaling before they change lanes. The other Infiniti system of note on the EX35, which should be out by the end of the year, is the Around View Monitor. Basically, it takes four video camera views from outside of the vehicle to create an in-dash, bird's-eye view of the vehicle to guide you into parking spaces. The system is speed limited to around 5 mph, but it has limitations. For more on the new parking assistant technology, read The New York Times article, "Parking With Help From Above." 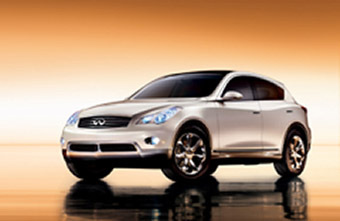 This entry was posted in Uncategorized and tagged infiniti, parking assistant, quain, tecnology. Bookmark the permalink.